The 2nd National Schools & Colleges Girls Throwball Championship 2018 for U-14 & U-19, was held at The City School Lahore Gulberg III, Lahore on 14th to 16th February 2018. In total 16 Schools & Colleges Girls Throwball Teams participated in this event from Karachi, Hyderabad. Quetta, Lahore and Islamabad. The final day concluded with the 1st position laurels going to DA Phase IV Defense, Karachi in U-19 category and to Hira School, Baluchistan in the U-14 category. Winners U-19 & U14 Teams: Rs. 100000. Runner Up Teams: Rs. 50, 000. Third Position Teams: Rs. 20, 000. Additional Trophies, Medals, Certificates and Gift hammers were also awarded to the team Managers and Coaches. 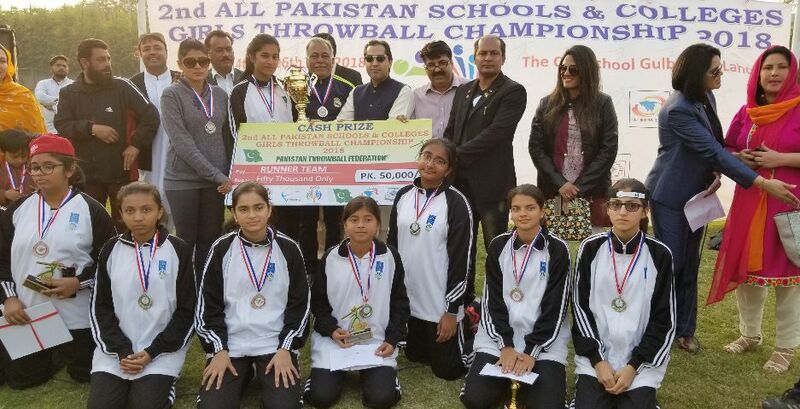 Mr. Maqbool Arain, Secretary, Pakistan Throwball Federation announced that the 3rd National Schools and Colleges Throwball Championship 2019, will be held at at Pakistan Sports Board, Islamabad. 1st. DA Phase IV Defense, Karachi. 2nd. The City Darakhshan Campus, Karachi. 3rd. Govt. Shah Latif Girls College, Hyderabad. DA Phase IV Defence, Karachi beat The City School Darakhshan Campus, Karachi … Set score: 2-1. Govt. Latifabad Shah Latif Girls College Hyderabad beat Beaconhouse Defense Campus, Lahore … Set score: 2-0. 2nd. The City School Shalimar, Lahore. 3rd. Dapus Seaview School, Karachi. Hira School Baluchistan beat The City School Shalimar Lahore … Set score 2-1. Dapus Sea View School, Karachi beat The City School Ravi Campus … Set score 2-1.